Bob Kroupa presents a creation seminar at the West County Church. (Photo submitted by Mary Schwantes). 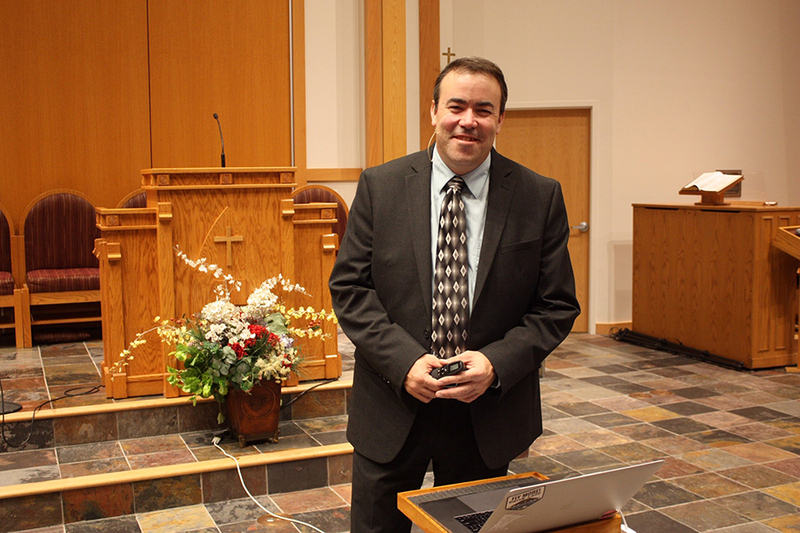 The West County Church recently hosted a creation seminar, presented by one-time member Bob Kroupa. The seminar addressed questions about the Big Bang Theory, the age of the earth, the speed of light, evidence for a literal seven-day creation, and various other relevant topics. Evidence was presented for a biblical creation being less than 10,000 years ago, how the earth was designed perfectly for life to exist, and how fossils are used to date the rocks they are found in—not vice versa. Bob has a special burden for this topic. He was raised Lutheran but attended public schools. As an adolescent, the things he was being taught about evolution caused him to doubt his beliefs, and by high school Bob considered himself an atheist. In college he began a fresh quest for truth about earth’s origins, using the scientific tools he had learned. “When I learned how to do scientific research, plus look at the evidence that’s consistent and repeatable, my mind set out to understand the Solar System, geology and everything related to how the world was formed,” he said.